IMPROVE YOUR EYESIGHT – EAT MORE FREEKEH! Have you noticed your eyesight isn’t what it used to be? Irritating isn’t it? Frightening even. Following the horrific crash of the Germanwings plane in the Alps two weeks ago, it turned out the 27-year old co-pilot responsible was suffering serious sight problems and had already lost 30 percent of his vision – possibly a trigger for his ensuing psychosis. Meanwhile an American study found blindness to be one of four most feared conditions, alongside cancer, HIV and Alzheimer’s. But I digress. Along with freekeh, here’s what you should eat to keep your eyes healthy: leafy green veg (kale is top of the pack, but spinach and Brussel sprouts are also excellent), citrus fruits and rainbow fruit and veg; dark coloured berries (blackberries, blackcurrants, blueberries), oily fish (salmon, trout, sardines) and ‘see’-food (prawns and oysters); eggs; almonds, walnuts and sunflower seeds. A couple of daily coffees have been shown to boost eye health too (read our post on caffeine here). And watch your salt intake – high levels of sodium have been linked to cataract formation. All in all, it sounds rather like what we modestly refer to as the Kale & Cocoa diet! It’s not just diet, of course. You also need to wear sunglasses in the sun, rest your eyes (particularly if you work on a computer for long periods of time), maintain a healthy weight and have regular eye tests. Read more at https://www.nei.nih.gov/healthyeyes/eyehealthtips. Our freekeh salad below contains one of my other favourite ingredients, dried sour cherries (also rich in lutein and zeaxanthin) and would go perfectly with our Easter lamb, or with plain grilled fish and a leafy salad. If you can’t get sour cherries, use cranberries or goldenberries (unsweetened if possible – you want that zingy tart-ness). The yogurt-y sauce that accompanies it will help fend off diabetes too, according to a new report that found regular yogurt-eaters to have an 18% reduced risk of type 2 diabetes. Boil the freekeh according to the pack instructions. While it’s cooking, dry roast the cumin and fennel seeds. When the freekeh is cooked (usually around 20 minutes), add the seeds (leaving a few for decoration if you want), sour cherries lemon zest and juice and olive oil. Stir in the chopped herbs and a tsp of sea salt. 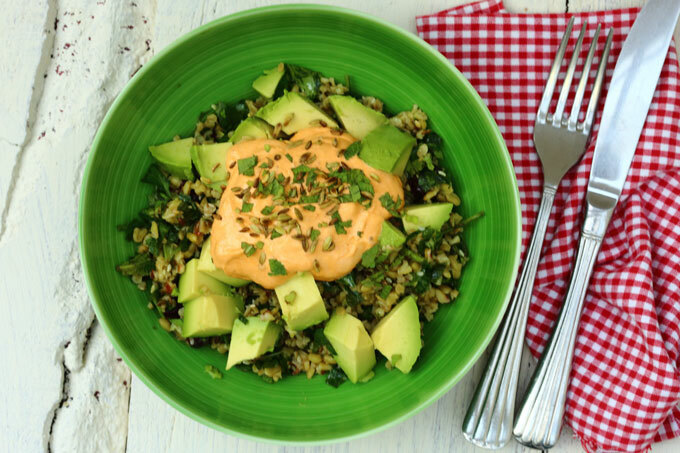 For the sauce, mix the yogurt, tahini and harissa and dollop on the freekeh salad as you serve. I sometimes eat this with nothing more than half a diced avocado for lunch, but it also works really well with roasted root veg, or roasted tomatoes and fennel, or a green salad and grilled chicken or grilled fish. Anything goes really …. What is it in green leaves that is good for Alzheimers? Is it that most green leaves are brassicas which I have heard are good for preventing bowel cancer (among other things)? Or is it the greenness? And if it is the greenness would broccoli – calabrese- do as well, or even peas and beans? There is quite a difference in the consituents of spinach, chard, cabbage, lettuce, Chinese leaf etc. Dark leafy greens are the most important thing to eat – even better than brassicas (and yes, brassicas have been shown to help prevent bowel cancer). Ideally you want all of them but dark leafy greens include: spinach, chard, kale, watercress, pak choi etc. Peas and broccoli (as i understand it) don’t have quite the same compounds – as neither are leaves. I’ve been putting a handful of kale in my morning smoothie and then making sure i get some other leafy green at lunch or supper. I think my memory has improved already!! I am 71. During my most recent eye test, in December, 2014, my optician photographed the back of my eyes, said I had the potential to develop M D and told me to eat plenty kale and spinach. I had never heard such a thing before. However, I am doing so and also pursuing a new way of eating; largely plant based, very little processed food and, of course, my greens. It’s too soon to know how it may be affecting the possible M D but I have so much energy I don’t feel like lazy old me at all. Hi Kay – so glad to hear there is one optician out there who’s aware of this and telling people! Do keep us posted on how your eyes respond to your new diet. And very pleased to know that all those greens have given you more energy … such simple things that can do so much for us.